I remember as a kid going to a photo studio with my sister on my 5th birthday to get a picture clicked. More than the photo it was the fuss created by two of us to get our picture immediately that I still l remember. Those were the pre digital era days and instant gratification from the pictures clicked was many years away. My first SLR was way back in 97 during the film days, I have spent 2 months salary to get one. I still have the same resting on a silk scarf with some moth balls. When traveling for my travel blog I carry my DSLR with all kind of zoom and other lenses (they don’t make you a better photographer only make your bag heavy), but when it comes to clicking pictures at home I trust my mobile phone with a basic 5 MP camera. This is what this post is all about. 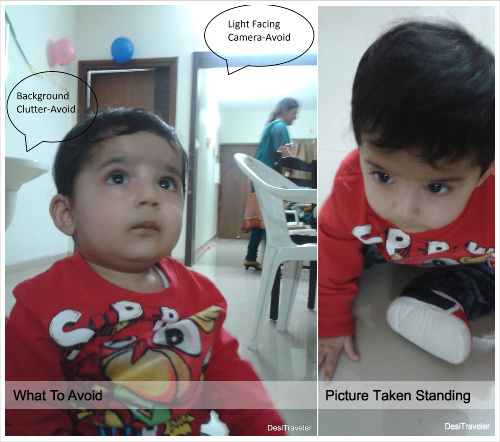 We all love clicking pics of our kids but clicking pics of kids is all about spontaneity and capturing the moment. For clicking pics inside home with the DSLR, I find it very cumbersome so I stick to using either my cell phone or a simple point and shoot camera. 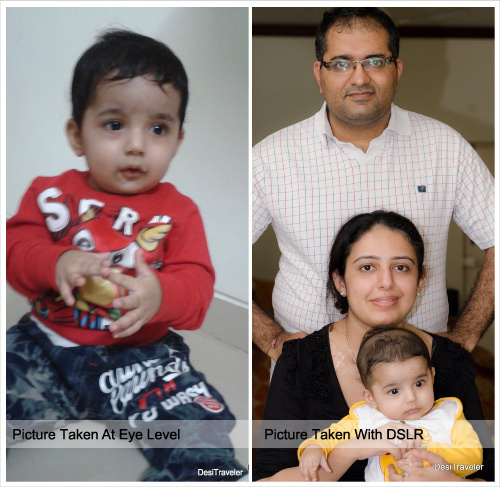 Though I am no pro but still I could not resist writing this post about how to click better pictures of kids in home. Please remember I am not saying that a camera or a point and shoot is a replacement for DSLR, but what I am saying is that for your day-to-day sharing on Facebook, and taking normal postcard size printouts any camera (including cell phone) with 5 mp or above is fine, and you need not worry about the complex setting on a DSLR. I used Avyaan Khatter who is all of 8 months old for pictures in this post using my 5 megapixel cell phone camera. Mega pixels: Don’t worry about them. Any phone or camera with 5 or above megapixels will take pics good enough to see on full screen mode on your PC/Laptop and share on Facebook etc. The bigger megapixels are useful for taking huge printouts (posters of movies) or when you want to crop out most of the pic and just keep a small portion (e.g. bird pics taken from a distance). For day-to-day use anything above 5 mp is good enough. Go to the level of Kids: A kid is much shorter in height from you so if you click the picture standing you will get a lot of headshots. The best practice is to go to their level so that you can click them at eye level, this means you need to either squat or sit on floor to reach her eye level. The pics will come livelier with the kid looking straight into the camera. Background Clutter: Make sure when you are clicking there is not much clutter in background, preferably click against a clean wall this way there will be no distractions in the picture. Avoid Flash: Inside a room do not to use a flash as at close distance it will make the picture washed out and small kids get scared of the bright light and start crying and then it will not be possible to click good pictures. Your Back To the light source: If you as a photographer are facing the light source then it will appear as a very bright white spot in picture. The right approach is that the subject should face the light source like a tube, or a bright window and you the photographer should have your back to the light source. 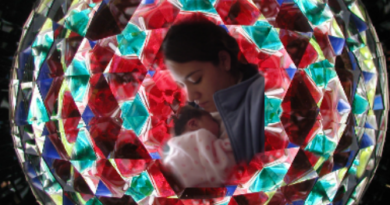 This will ensure that the kid is properly illuminated and there are no big bright white spots in the picture. Use Blast Mode: Most cameras come with blast mode in which you can click 5 or more pictures with one click, use this mode then pick up the best picture. This is helpful as the kids are never steady and when the camera clicks 5 or more pictures it clicks at a very high shutter speed freezing the moment and one picture is likely to come to your satisfaction. Use Both Hands: Yes it sounds too basic but a lot of people hold the camera in one hand and then complain their pictures are not sharp enough. A simple way to avoid this is to use both hands to hold the camera and touch your elbows to your body to be as stable as possible when the shutter is pressed. Go Candid: The more you try your kids to pose the more they will hate it, it is best to click pictures spontaneously when they are doing something they enjoy doing like playing with a favorite toy talking to friends. This will ensure pictures come as natural as possible and the kid is not disturbed. Remember the aim is to capture what kid loves to do not what you love her to do. Post processing: You can use any free software like Picasa or Picmonkey to do some basic post processing to sharpen pictures, crop them as well as to make some basic changes to color tone and light. Don’t overdo it as then your kids will look like plastic dolls and unnatural. Also attached is a picture of Avyaan taken with a DSLR and you can see the picture is much sharper and better in quality without any blur compared to the pictures taken with the cell phone. But if you are looking the pics on a laptop screen the difference is not much and it is your choice if you want to invest in a DSLR or are happy to take pictures from a cell phone. These are some very simple things you can do to click better pictures of your kids which will make them better and more lively and hopefully your kids would not mind you sharing them on Facebook.